In a medium bowl, lightly beat the egg, add the seasonings, add the beef and grated onion. Mix until combined. Form into thin patties. Spread butter on one side of each slice of bread. Heat a large heavy skillet over medium-high heat. Cook the burgers about 3 minutes on each side. Drain on paper towels. Drain the grease from the skillet. Grill the sliced onions with a dash of Worcestershire for a few minutes on each side then set aside. In the same skillet, place 4 slices of bread, butter side down. 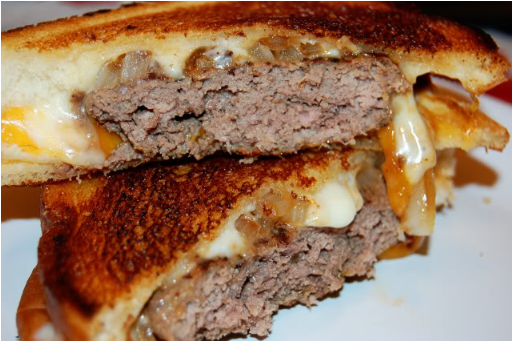 Top each with a slice of cheese, some onions and a burger. Top with remaining slices of cheese, if using, and bread, butter side up. Cook each sandwich until golden brown, about 2 minutes per side. Makes 4 to 6 burgers.